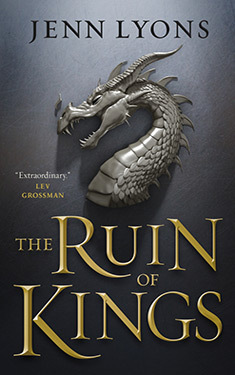 If you liked The Ruin of Kings you might like these books. (Kihrin's story)When they brought me up to the auction block, I looked out over the crowd and thought: I would kill you all if I had a knife. And if I wasn't naked, I amended. What do you mean by "beginning" anyway? Whose beginning? Mine? I don't remember it that well. Yours? Talon, you're thousands of years old and have stored the memories of as many people. You're the one who wanted to hear this. And you will, but under my terms, not yours. The auctioneer's voice boomed out over the amphitheater: "Lot six this morning is a fine specimen. What will I hear for this human Doltari male?† He's a trained musician with an excellent singing voice. Just sixteen years old. Look at that golden hair, those blue eyes, those handsome features. Why, this one might even have vané blood in him! He'll make a welcome addition to any household, but he's not gelded, so don't buy him to guard your harem, ladies and gentlemen!" The auctioneer waved his finger with a sly grin, and was answered with a few disinterested chuckles. "Opening bid is ten thousand ords." Several members of the audience sniggered at the price. I didn't look any prize that day. The Kishna-Farriga slave masters had bathed me but the scrubbing only made the raw whip wounds on my back stand out in angry red stripes. Copper bangles on my wrists did a poor job of camouflaging sores from long months spent in chains. The friction blisters on my left ankle were swollen, infected, and oozing. Bruises and welts covered me: all the marks of a defiant slave. My body shook from hunger and a growing fever. I wasn't worth ten thousand ords. I wasn't worth one hundred ords. Honestly, I wouldn't have bought me. "Ah, now don't be like that, my fine people! I know what he looks like, but I promise you, he's a rough diamond who only needs polish to shine. He'll be no trouble either--see, I hold his gaesh in my hand! Won't someone here pay ten thousand ords for the gaesh of this handsome young slave?" The auctioneer held out his arm and revealed a tarnished silver chain, from which dangled something that glittered and caught in the sun. The crowd couldn't see the details, but I knew what he held: a silver hawk, stained black from salt air. A part of my soul, trapped in metal: my gaesh. No, my body may not have been worth much, but in Kishna-Farriga the going price for a man's soul is ten thousand ords. The crowd stirred and looked at me with new eyes. A troublemaking teenage boy was one thing. A teenage boy who could be healed and perfumed, forced to obey every whim his owner might command, was quite another. I shivered, and it had nothing to do with the warm breeze that prickled the hairs on my skin. It was a fine day for a slave auction, if you're into that sort of thing. The weather was hot, sunny, and the air tinged with the stink of gutted harbor fish. Paper umbrellas or canvas awnings obscured the bidders as they lounged on cushioned seats. Kishna-Farriga was one of the Free States, border city-states that owed no fealty to their neighbors but relied on shifting political tensions* to keep themselves off anyone's leash. Countries who didn't want to deal with each other used Kishna-Farriga as a halfway entrepôt for trade goods and commodities--commodities that included slaves such as myself. Personally, I was used to the slave markets of the Quuros Octagon, with its endless mazes of private chambers and auction theaters. The slave pits in Kishna-Farriga weren't so elaborate. They used just one open-air stone amphitheater, built next to the famous harbor. At maximum capacity, the rising stone steps seated three thousand people. A slave might arrive by ship, visit the holding cells underneath the amphitheater, and leave with a new owner the same day--all without clearing the smell of dead fish from their nose. The auctioneer continued to speak. "Do I hear ten thousand?" Reassured that I was tame, a velvet-clad woman of obvious "professional" talent raised her hand. I winced. I had no desire to go back to a brothel. A part of me feared it would go this way. I was by no means homely, and few are those who can afford the price of a gaeshed slave, without means of recouping their cost. "Ten thousand. Very good. Do I hear fifteen thousand?" A rich, fat merchant leered at me from the second row and raised a little red flag to signal his interest. Truth be told, he raised all kinds of red flags. His ownership would be no better than the whorehouse madam's, and possibly quite worse, no matter what my value. "Fifteen thousand? Do I hear twenty thousand?" My gaze lingered on the man. He appeared ordinary: of medium height and weight, nondescript but pleasant, his dress stylish but not extravagant. He had black hair and olive-brown skin--typical of Quuros from west of the Dragonspires--but his boots were the high, hard style favored by Easterners. Jorat, perhaps, or Yor. In addition, he wore a shirt of the Marakor style rather than an Eamithon misha or usigi wrap. The only remarkable qualities about Lord Var were his confidence, his poise, and the fact the auctioneer recognized him. Var didn't seem interested in me. His attention focused on the auctioneer; he barely glanced at me. He might as well have been bidding on a set of tin plates. I looked closer. No protection, hidden or otherwise, and not even a dagger in one of those unpolished leather boots. Yet he sat in the front. No one crowded him, though I'd spotted plenty of pickpockets working the crowd. I'd never been to Kishna-Farriga before, but I didn't have to be a native to know only a fool came to this auction house without bodyguards. I shook my head. It was hard to concentrate. Everything was noise, flashing light, and waves of cold--which I suspected were from a fever. One of my cuts had become infected. Something would need to be done about that soon, or I would be the most expensive paperweight some poor gull had ever purchased. I've always been skilled at seeing past the First Veil. I had once thought this talent would be my redemption from the Capital City's slums, back when I was naïve enough to think there was no fate worse than poverty. There are three overlapping worlds, of course, each ruled by one of the Sisters: the world of the living, the world of magic, and the world of the dead. * We live in Taja's realm, as do all mortals. But I'd learned from a young age that my talent for seeing past the First Veil, into Tya's magical domain, was a terrific advantage. Only the gods can see past the Second Veil, although I suppose we all do when we finally travel to what lies beyond, to Thaena's realm--Death. ... unless you can see past the First Veil yourself, in which case that talisman-enhanced aura always betrays a wizard's profession. And no, lovely Talon, not even with you. Who was I kidding? There was no luck left for me. I had angered my goddess, lady of luck both good and bad; her favor was gone. I did not even dare to hope that Lord Var would treat me better than the others. No matter who won me this day, it didn't change that I was a slave, and would be so until the moment of my death. A normal slave might hold out some faint hope of escape or buying his or her freedom, but a gaeshed slave can't run, and no one would ever free them. They are worth too much. "The bid is twenty thousand. Do I hear twenty-five thousand?" The auctioneer wasn't paying attention anymore: he thought the sale all but over. He'd done well to fetch twenty thousand. That price exceeded his expectations. "Twenty thousand, going once, going twice. Fair warning--"
"Fifty thousand," a clear voice said from the top of the seats. Murmurs spread through the crowd. I strained to see who'd placed the bid. It was a large stadium. I couldn't see the speaker at first, but then I noticed who the rest of the crowd had turned to watch: three seated figures in black hooded robes. The auctioneer paused, surprised. "The Black Brotherhood bids fifty thousand. Do I hear fifty-five thousand?" "Fifty-five thousand. Do I hear sixty thousand?" The auctioneer was awake now that there was a bidding war. One of the three black-clad figures raised their red flag. "Sixty thousand." The auctioneer nodded at them. "Do I hear seventy-five thousand?" "I have seventy-five. Do I hear one hundred?" The auctioneer saw the black-clad figures' flag rise again. "I have one hundred from the Brotherhood. Do I hear one-fifty?" "One-fifty. Do I hear two hundred?" The red flag rose. "I have two hundred. Do I hear two-fifty?" Var frowned, but made a quick wave of his fingers. "I have two-fifty from Lord Var. Do I have five hundred from the Black Brotherhood?" I might be gaeshed, but I couldn't be ordered to hand over what no one knew I possessed. "The Black Brotherhood bids a half-million. Do I hear seven hundred fifty thousand?" The auctioneer's voice broke. Even he seemed stunned by the price rising from his throat. "Lord Var?" the auctioneer asked. Var grimaced and turned to glare over his shoulder at the three figures. "Yes," he said. "I have seven hundred fifty thousand ords from Lord Var. Do I hear one million?" The figures in black didn't hesitate. "I have one million ords. Final warning." The auctioneer paused for the required time. "Sold to the Black Brotherhood for one million ords. Ladies and gentlemen, we have a new record!" The end of the staff pounded down on the floor.